Adding our Karaoke packages with over 30, 000 songs and up to (3) wireless microphones to your existing event can be a lot of Fun! 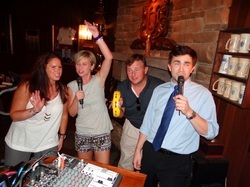 Hosting a "Karaoke Only" party can also be lots of fun too! 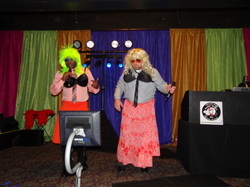 Our Karaoke packages also include, flat screen TV and song books. Upgrading Karaoke to our *Super Karaoke* package includes Interactive Party Props. It's like a "Photo Booth" but the Party Props are not confined to a booth! Adding Tambourines, Maracas, Feather Boas, Crazy Hats and Replica Guitars will elevate the experience BIG TIME! Wanna play a little Kamikaze Karaoke during your regular designated karaoke times? The guys have to reach in a bag of random songs (which are ALL Female vocalists) and when they pull out a song, that's what they have to sing. Add that with wigs, feather boas and it's ON! The same applies for the gals. They will have to wear beards when they pull songs from Z Z Top or Soggy Bottom Boys. 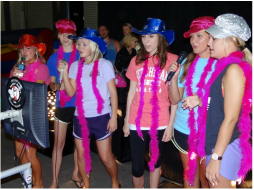 Want your Karaoke Stars to really shine on stage? You know people are gonna take candid pics and video the singers and then post to social media, so why not "Let Em' Up" with our Special Karaoke Stars Lighting. 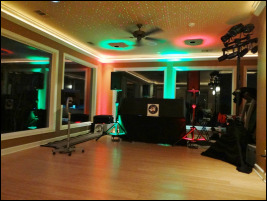 This will definitely create energy and excited for the party.